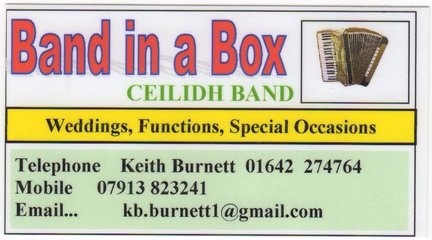 If you cannot afford a full Band why not try us. Norton Green consists of one competent lady accordion player with a £6000.00 accordion, and she comes with a competent Ceilidh Caller that has forty years of calling behind himself. We are PAT Tested and come with our own P.A. and we have Public Liability Insurance. All this will cost you is £250.00 up to £300.00 depending how far we have to travel. We will cover your evening of four hours doing two spots with our break to coincide with your buffet being served or supper. We will travel up to 100 miles. We even play music in between dances while you are resting, we can play sing along songs or any of your requests.